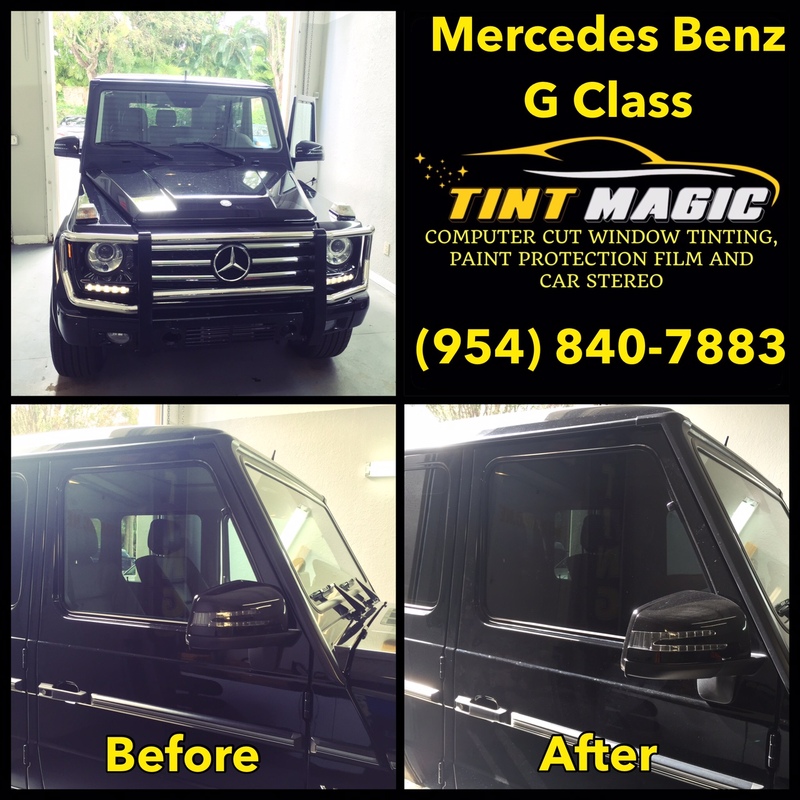 Mercedes Benz G Class at Tint Magic Window Tinting Coral Springs. We have applied 25% CXP window film over 2 front windows for the best heat rejection and UV protection. Tint Magic Window Tinting use state of the art computer-cut window film for a perfect fit everytime. Call us for the best quality and service in South Florida! (954) 840-7883. In automotive terms, a 36-year-old vehicle qualifies as downright elderly, yet the venerable Mercedes Benz G-wagen shows no sign of retiring. The end of the production run for the current G-class is at least two or three years away, when Daimler will launch a thoroughly redesigned model, but we wouldn’t be surprised if Mercedes decided to keep building the original even after that. While it may not need any help in the market—the G-wagen virtually flies out of dealerships—Mercedes has gone ahead and replaced the entry-level engine with a more modern, more efficient, and more powerful unit. The previous, naturally aspirated 5.5-liter V-8 makes way for a new, twin-turbocharged 4.0-liter V-8—ostensibly the same engine the powers the AMG GT supercar. It’s rated at 416 horsepower and 450 lb-ft of torque, a significant step up from its predecessor’s 382 horsepower and 391 lb-ft. The factory-stated zero-to-62-mph time drops to 5.9 seconds, while top speed remains governed at 130 mph. EPA figures aren’t in yet, but we would not expect a whole lot of improvement over the old engine’s 12/15 mpg city/highway ratings. We loved the previous 5.5-liter V-8—it fired up with a bark and emitted a pleasingly guttural, almost AMG-like soundtrack. So we’re happy to report that the new engine, despite turbocharging, sounds very similar to the old one. Moreover, there is essentially no turbo lag, and the engine propels the G-wagen forward with astounding force. Torque is transmitted to all four wheels through a seven-speed automatic.